Who plays Gaelic football in Tasmania? people who enjoy a run around on a weekday or weekend , a bit of fun and an opportunity to socialise. soccer, AFL, hockey and rugby players looking for an off-season sport to sharpen their skills. people wanting to improve their fitness levels in a supportive team environment. There's room for you too so give it a go! Our committee and players will make you feel welcome. Tas League is a premier competition with separate Gaelic football divisions for men and ladies. The season is played round robin over January and February, culminating in a Grand Final. The Social League is our main competition in 2018. Players of all abilities from 14 and up are welcome to play Gaelic football in mixed teams. The 6-week season will run from 14 November and will be played on midweek evenings. To date we have not had the resources to get these sports off the ground in Tasmania. 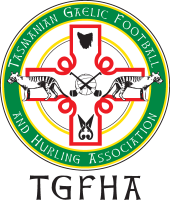 The TGFHA is looking at ways to start up hurling (men) and camogie (ladies) in the future. Please get in touch if you are keen; experienced players and coaches are particularly required. The Tassie 7s Blitz is a one-day lightning premiership played in March. Interstate teams (upon invitation) and locals get together for a feast of fun and football. We are inviting an interstate team to play against us on Sat 16 March 2019 and enjoy St Pat's Day with us on the Sunday. We will be selecting a Tasmanian representative team to don the coveted green, red and yellow jersey of Tasmania. Check back for further details closer to the date. Padraig Pearse's 7s is a one-day tournament played in Melbourne, usually in late February. TGFHA has sent teams in the past so please contact us if you are interested in this interstate trip. Here's some video of our 2016 ladies team in action.